Both political parties have released broadband policies for the next federal election. These contain terms such as "WiMax" and "FTTN". Recently a debate on the accuracy of broadband statistics broke out, with competing definitions of broadband being debated. The future of the Australian economy depends on the outcome of these debates. This presentation will demystify some of the terms in the current debate, look at what we have now and what the policy options for the future are. As an example of the uses for broadband, the ACS's online education system, using Australian developed open source software will be discussed. Helped Incat selling ships to the US military at the Sydney Olympics. Tom Worthington is Director of Professional Development for the Australian Computer Society. He is past Director and a member of the ACS Telecommunications Board and ACS's representative on the Australian Bureau of Statistics ICT Reference Group. Tom presented the ACS position on Internet regulation to the Senate. He is a past president, fellow and honorary life member of the ACS. Tom is an independent IT consultant and Visiting Fellow at the Australian National University. In 1996 he recommended to the Tasmanian Premier selling salmon on the Internet and in 2000 helped Incat selling ships to the US military at the Sydney Olympics. Access to the Internet can provide benefits to business, government and the community. Online systems can be used for education and to lessen greenhouse gas production. However, as the Internet is increasingly used, it can disadvantage those who do not have it, or only have limited access. The OECD defines broadband as 256 kbps or more, download. Perhaps more importantly than the speed, is to have a reliable and continuous connection. Having an unreliable dialup connection which takes a minute to connect and blocks phone use greatly reduces the usability of web services. One use for a broadband link is to provide real time digital video on demand (ipTV), in place of cable and broadcast TV. However, this requires 2.5 Mbps or more, or about ten times the bandwidth of the minimum broadband connection. This can be an expensive way to deliver TV in areas not already equipped for high speed broadband. In cities broadband can be provided by fibre optic cable to large businesses. It is generally not economically viable to provide fibre optic cable for the last few hundred metres to individual homes (called "Fibre to the Home" or FTTH). This is called the "last mile problem". The solution in cities is to use copper telephone cable with ADSL modems for the last few km. 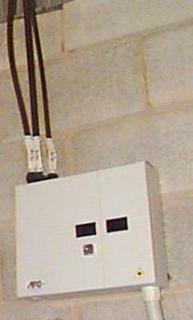 In Australia ADSL modems have been typically used on existing telephone lines, with modems added to existing telephone exchange buildings. However, as longer lines are used the data which ADSL can carry drops away. To overcome this, Telstra has proposed using Fibre to the Node (FTTN), which places the ADSL equipment in a small roadside cabinet closer to the home. This system is used in Canberra by Transact. Telstra's proposal creates a regulatory difficulty for the government as there is not sufficient room in the roadside cabinets for other telecommunications companies to put their own ADSL equipment. ADSL is limited to operating over a few km (up to 7 km with some versions of ADSL2). ADSL also requires good quality copper cable to be used. Cables in country areas and those using devices to increase phone capacity may interfere with ADSL. ADSL requires equipment from the telephone service provider and the ISP to be installed at the end of the cable. This can cause regulatory and maintenance problems if these are two different companies and they do not cooperate. ADSL requires a cable to be used, so the service cannot be used while moving or where no cable infrastructure is provided. WiFi/IEEE 802.11 not suitable outside CBDs (Google Option). 3G mobile: priced as a premium service. There are a number of wireless data technologies which can be used to provide broadband. 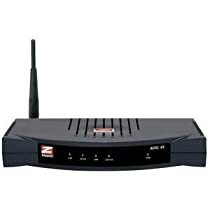 WiFi/IEEE 802.11 provides wireless broadband on unlicensed (shared) frequencies, bit the range is limited to around 45 metres, without external antennas. It is useful in homes, offices and at public "hot spots", as many laptops and mobile devices have WiFi built in. But not suitable for a puiblic broadband service due to the short range, except for some CBD areas. Google have proposed installing wireless broadband in US cities. WiMAX/IEEE 802.16 is a similar technology to WiFi but more suited to a public service with longer ranges of around 10km. WiMax versions allow for the use of shared (unlicensed) or dedicated (licenced) spectrum. Unwired, are planning to convert their proprietary wireless city networks to WiMax. The Optus/Elders consortium, OPEL Networks Pty Ltd (OPEL), is to build an unlicensed WiMax network with government funding. 3G mobile: third generation of mobile phone standards provide broadband at up to 14.4 mbps. Testra's NextG network uses High-Speed Downlink Packet Access (HSDPA) and a lower frequency which is claimed to give better range in country areas. However, the major problem with all Australian 3G services currently is that they are priced as premium services costing ten to one hundred times as much as ADSL. Testra NextG PC Card, in a NetComm N3G001W 3G Wireless Router, was used to provide broadband to twenty laptops at an IT conference in the NSW Hunter Valley, deomonstrating the system works in regional areas. ALP: FTTN ADSL to 98%, rest unspecified "improved broadband services"
The ALP and Coalition broadband policies propose use of similar technologies, with differences in how they are paid for and the level of industry cooperation required. Both policies promise 12 mpbs to at least 98% of Australia. The ALP opt for FTTN ADSL and the Coalition for ADSL plus WiMax. ALP: New Directions for Communications - A Broadband Future for Australia – Building a National Broadband Network, March 2007, proposes a 12 mbps FTTN system for 98% of the population. The policy says the other 2% in regional and rural areas will have "improved broadband services", but does not say how. Also the use of FTTN would make it difficult to allow more than one company to install its ADSL equipment. Coalition: Australia Connected: Fast affordable broadband for all Australians, Helen Coonan, Minister for Communications, Information Technology and the Arts, Media Release 80/07, 18 June 2007. The policy says 99 per cent of the population will have 12 megabits per second by mid 2009. This will use a mix of ADSL2+ and WiMax, costing from $35 to $60 per month, retail. The Optus/Elders consortium, OPEL Networks Pty Ltd (OPEL), is to build the system. One issue is the use of unlicensed WiMax networking for part of the system. This has a higher risk of interference. The proposal is to use existing telephone exchanges for the ADSL2+, rather than FTTN. What is Broadband Good For? In assessing broadband proposals, the Australian community needs to look at what is affordable, how much we need and what it is useful for. It is not feasible to provide fibre optic broadband to the entire Australian community, the cost of the cabling to individual homes in remote areas would prohibitive. A mix of copper cable with ADSL for urban areas and wireless for regional areas looks both technically feasible and affordable. However, the question needs to be asked how much broadband we need and what for. This is a question I have discussed in technical forums, with experts from government agencies, telecommunications companies and the most expert researchers in Australia. The discussions tend to end up going around in circles after a while and generally reach the conclusion that this is not a techncial question and one which has to be left to the customer. Experts can say what broadband might be used for, but the customers need to decide what is useful. One important point is that much of the discussion of the need for broadband is not about speed, it is about reliability and easy access. The speed of a good dial-up data connection is sufficient for email, browsing text rich web pages and for Internet radio. The problem is with unreliable connections on poor quality phone lines, the need to wait while a connection is made and the loss of phone access while the line is used for data. Low speed broadband connections (256/64 kbps) provide a great increase in utility as a result, by overcoming these problems. A step up from low speed broadband to about 1Mbps provides for more image rich web browsing and limited video (of near broadcast quality). This would also be sufficient for most small business users. The 12 mpbs promised by both political parties is sufficient for high definition TV. One issue which appears not to be addressed in either party policy is the relationship between the broadband service and telephones. Current ISP services are made to a lower level of relaibility than the telephone service. Internet Telephony (Voice over IP or VOIP) is gaining in popularity, but ISPs and VoIP providers warn the customers not to rely on the service in an emergency. However, if the Australian community is investing billions of dollars in a new telecommuncations system, it makes little sense to build an unreliable one. It seems very likely, that despite advice, that most people will come to rely on their broadband connection. That service, perhaps in combination with a mobile phone, should be built to a level of reliably of the current telephone service. What Can Tasmania do About Broadband? Seek advice from local experts, projects and users. In his keynote address to the Influence Forum 2007 recently, Paul Twomey, CEO of ICANN, suggested the Australian discussion of broadband needed to move from how, to what for. However, it will fall largely to ICT professionals to do the "how" and we need to educate ourselves as to the options. In many ways the problems of providing telecommunications in regional areas of Australia are similar to those of developing nations. Australia can learn from efforts such as those for Mobile Web in Developing Countries. This can be done with short courses, formal courses and special interest groups. Tasmanian ICT professionals can join with their colleagues in the ACS, and via the ACS with other national and international groups. IT professionals can also call on the skills of local experts and companies. In 2002 the ACS awarded the ANCCAC Medal, to Professor Arthur Sale of University of Tasmania for his paper "Broadband Internet Access in Regional Australia". The company eBurnie Connect is an initiative from the Burnie City Council to provide broadband services to their local community. The Spirit of Tasmania is looking at the provision of wireless broadband aboard ship, to complement mobile phone access. The above presentation was prepared for the Tasmanian Branch of the ACS in September 2007. At the 2007 Annual General Meeting of the Branch in Hobart on 13 September 2007 there was a discussion of how the ACS could help those in need in developing nations and in Tasmania. The members discussed the best way to provide financial and other assistance. So for the last talk on Boradband in Lanceston I added this postscript suggesting onne way might be to help create affordable web based services of community benefit which can be used in Tasmania and in developing nations. Students of ICT at Tasmanian institutions could research and build the applications with students from and in developing nations. As an example of such work the ACS nationally previously sponsored work to modify the Sahana disaster management system for use in Indonesian earthquake recovery. The open source software was modified by Indonesian software engineering students, in consultation with staff at ANU and CSIRO in Canberra. Previously I had assisted the modification of the same software to operate on hand held devices for use in disaster zones. The Optus/Elders consortium, OPEL Networks Pty Ltd (OPEL), is to build a wireless system in Tasmania, at the same time Telstra are upgrading their wireless 3G network. As I discussed in my talk, this poses a potential risk to the community as people and businesses come to rely on these systems, which may be less reliable in a disaster than the land line telephones and broadcast radio they displace. The ACS could sponsor research by students on these systems can be used in combination to be reliable for use in an emergency and to build systems to communicate with the public and coordinate relief operations. Such a system would be designed to use the minimum of bandwidth available via whatever links survive. This same system could then be provided as free open source software for use across Australian and in developing nations. The work could be in conjunction with the W3C's Mobile Web in Developing Countries. This work could include advice on Emergency Web Page Design for Local Government and other aspects of emergency use of ICT. In this way the ACS would be making a useful contribution to the local community, to developing nations and at the same time encouraging young people to start a career in ICT which is more than just about making money. In addition this would make Tasmania a centre for ICT.